Can you translate “Maine, the way life should be” into Chinese? If not, don’t worry – the Maine Office of Tourism has done it for you. The agency recently launched a website in Chinese in an attempt to bring more Chinese tourists to Maine. The country’s burgeoning middle class – and its increasing ranks of wealthy investors – are drawing interest from Maine businesses and government officials, a group of whom will be leaving Saturday on a trade mission to China and Japan. Although the trade delegation will seek more export opportunities for Maine products such as lobster and composite materials, it is also trying to develop partnerships that will lure Chinese money to Maine in the form of tourism dollars, tuition payments and business investments. The growth of the Chinese economy over the past decade has propelled millions of Chinese families into the middle class, driving huge increases in consumption. It’s estimated that 500 million Chinese – more than the entire population of the United States – will enter the middle class over the next decade, according to the consulting firm Ernst & Young. Many of those people will look for U.S. vacation destinations and American educations for their children, as well as investment opportunities that promise more stable returns than those in China, whose economy has been on a roller coaster for the past six months. Maine is positioning itself to capitalize on that interest. Nearly one in 10 Chinese visitors to the United States came to New England in 2014, though how many made their way to Maine is unknown, said Carolann Ouellette, director of the Maine Office of Tourism. But she’d like to attract more of them. The tourism office’s Chinese Web page, launched in June, is part of the Chinese website of Brand USA, an organization that promotes the U.S. as a travel destination. Maine’s Web page highlights bright-red lobster (the color red symbolizes good fortune in China), L.L. Bean, Acadia National Park, Mount Katahdin and the Maine Mall. A contributing factor to the influx of Chinese tourists to New England, said Ouellette, is that Hainan Airlines began offering the first nonstop service between Boston’s Logan International Airport and Beijing in June 2014. Last week the airline was advertising nonstop, round-trip tickets between Boston and Beijing for $750. Not only are more Chinese tourists making their way to New England, they’re exploring destinations beyond the typical, said Suzanne Fox, a consultant based in Portland who advises Maine businesses interested in working in China. Coming from a society of rapid urbanization, Chinese tourists are drawn to pristine natural environments. There also are local efforts to boost Portland’s appeal in China. Creative Portland, a quasi-public nonprofit that supports and promotes Portland’s arts and cultural communities, in July submitted an application to UNESCO for Portland to become a member of its Creative Cities Network as a gastronomy hub. As part of the application process, Fox traveled to Chengdu, the capital city of Sichuan Province, which is recognized by UNESCO for its gastronomic heritage. In June, she met with its vice mayor, Fu Yonglin, to discuss the possibility of a sister city relationship over the cities’ shared passion for food and art. She promoted Portland’s rising reputation for restaurants and foodie culture and compared that with Chengdu’s celebrity as the hotbed of Sichuan cuisine. “I talked the good talk and he loved the proposal,” she said. Last week, Fox received an email from Vice Mayor Fu. Creative Portland will learn in December whether UNESCO approves its designation as a Creative City. Maine isn’t only interested in boosting exports to China; it also wants to grow imports of a very valuable product – Chinese students. There are between 1,000 and 1,500 Chinese students studying in Maine right now, said Wade Merritt, vice president of the Maine International Trade Center, which is organizing the trade mission. Those students have helped boost enrollment numbers and tuition dollars at Maine’s private high schools, and to a lesser extent its public schools. Thornton Academy is one such school. Eight years ago, worried about falling enrollment, Thornton’s board decided to build some dorms and start recruiting foreign students to the school, which offers sixth through 12th grades. This year, 150 international students are enrolled at Thornton, and just a tad under 50 percent are from China, said Ritzo, the associate headmaster for advancement. Each of those students is paying $45,000 in tuition, room and board. The school isn’t sending a representative on the trade mission, because staffers already make at least two trips a year to China. In fact, Thornton’s director of admissions was in China last week marketing the school to prospective students. The University of Maine, which currently has 107 students from China in its undergraduate and graduate programs, will be sending representatives on the trade mission. Although student recruitment will be on the agenda, Jeff Hecker, UMaine’s provost and executive vice president for academic affairs, also will be looking to strengthen existing research-and-development partnerships with educational institutions in Japan and China, and create new ones. He’ll meet with representatives of Tokyo Metropolitan Institute of Gerontology to explore opportunities for collaboration, and with representatives of Shanghai Ocean University, with which UMaine already has a partnership. “It’s a long way to go, so we’re trying to kill as many birds with one stone as we can,” Hecker said. Last week, The New York Times reported there are now more billionaires in China (596) than the United States (537). During the trade mission, Gov. Paul LePage and his commissioner of economic development, George Gervais, will promote Maine as a place to invest. Chinese and Japanese companies increasingly look at overseas investments as a pathway to growth, said Tony Kieffer, managing partner of Maine Asia, a Portland-based consulting firm that helps Maine companies interested in doing business in China. To entice more foreign investors, the trade center in January opened an office in Shanghai to act as a conduit for Chinese investors who want to learn more about investing in Maine, and the LePage administration this summer said it was considering seeking federal approval to establish a program to award permanent U.S. residency to foreign investors willing to make significant investments in Maine. But even without such a tool, known as the EB-5 program, Chinese investors have already targeted Maine. In July, the Shengton Group of Beijing announced plans to invest $40 million to build a luxury medical tourism facility in Auburn. Its subsidiary, Miracle Enterprises, acquired two former shoe factory buildings in the city this summer that will be renovated to contain suites where wealthy Chinese nationals will come for medical treatments provided by Central Maine Medical Center in Lewiston, said Roland Miller, Auburn’s economic development director. He expects the renovations will take two years, but once complete, the rehab center will provide a steady regional economic impact. “This is the first investment that this company has done in the United States, so this is a real fantastic win for Maine and for our region,” Miller said. In addition to this future medical tourism facility, it was a Chinese investment group – International Grand Investment Corp. – that purchased in 2010 the Woodland Pulp mill in Baileyville. Last year, it said it would invest as much as $120 million to install two tissue paper machines in the mill. LePage and his staff will meet with representatives of both Chinese investment groups while they’re in China. Even local municipalities recognize the opportunities. The city of Westbrook last month held an informational meeting with the Hong Kong Trade Development Council for local business owners interested in doing business in China. Bill Baker, Westbrook’s economic development director, organized the conference also as a way to highlight Westbrook in the eyes of Chinese investors. It was small – about 15 people attended – but the results could be large if the right connections were made. “What will come from it remains to be seen, but it does seem like a market with a lot of potential for Maine companies,” Baker said. With the exception of Canada, all of Maine’s largest trade partners are in Asia. Japan, Malaysia and South Korea have consistently been major export partners for decades, but the big surprise is China. In 1996, China was Maine’s 20th largest trade parter, importing less than $10 million worth of Maine-made goods. Since then, the value of Maine exports to China has increased nearly 1,760 percent, to $184 million in 2014, placing it second only to Canada. 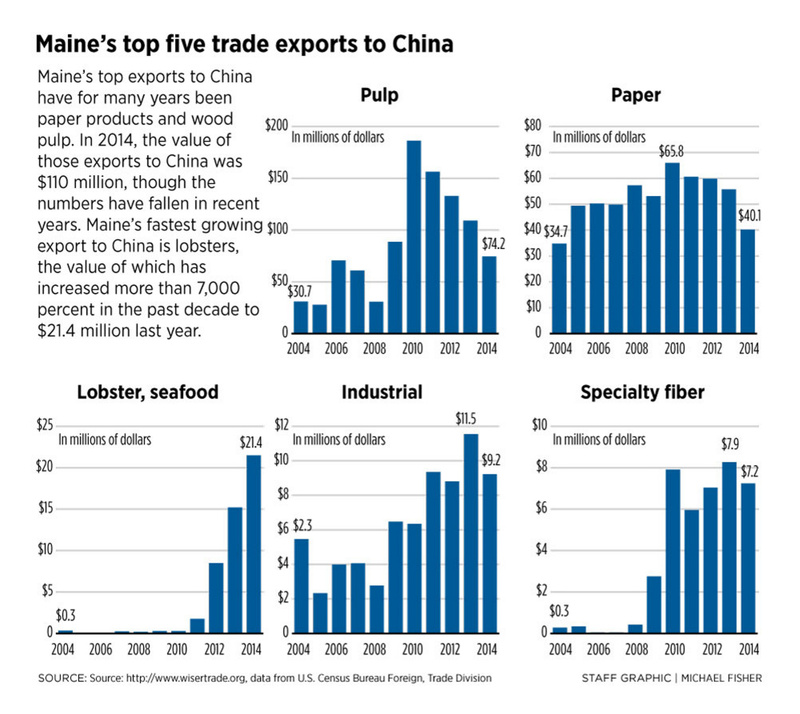 The fastest-growing Maine export to China is lobster. Last year, China imported nearly $26.4 million worth of Maine’s famous crustacean – live, frozen and processed, according to trade data from federal sources. In 2009, a meager $3,775 worth of Maine lobster made its way to China – that’s an increase of 698,302 percent in five years. 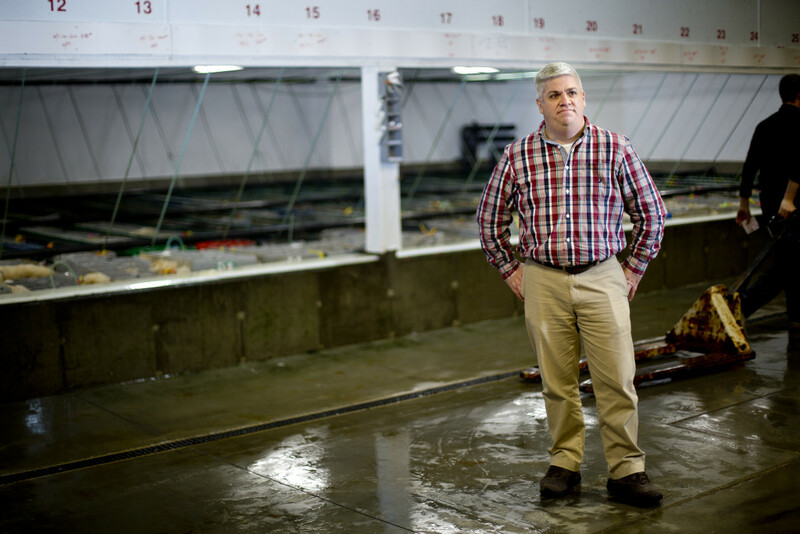 There are several reasons for that explosive growth, said Lyle Brown, who handles business development in Asian markets for Maine Coast Seafood in York. One, Maine lobsters are less expensive than spiny Australian lobsters, which is a popular dish at Chinese New Year events and weddings because they resemble dragons, a revered mythical creature in China. The average cost per pound of Australian lobster in China is $28, compared with $8 per pound for Maine lobster, Brown said. Maine lobsters also have the advantage of, when cooked, turning red – a color that in China symbolizes good luck and celebration, Brown said. “That’s a huge, huge thing. It’s a good marketing tool to use it for celebration events, such as weddings,” Brown said. “Couple that with the growing transition of people into the middle-class economy who can afford that,” and the market opportunity is clear. Maine Coast shipped 1.2 million pounds of live lobster to China in 2014, a 15 percent increase from 2013. During the Maine International Trade Center’s last trade mission to China in 2012, it organized a large Maine lobster marketing event in Hong Kong. More than 60 Chinese seafood buyers attended the event, said Janine Bisaillon-Cary, the center’s director. Bisaillon-Cary said a similar lobster-centric event in Shanghai is planned for the upcoming trip. Brown, who once lived in China and speaks Mandarin – China’s official dialect – will accompany the trade mission to Shanghai, where he’ll meet with Maine Coast Seafood’s existing trade partners. After that, he plans to travel to the city of Qingdao for the 2015 China Fisheries and Seafood Expo, which is expected to attract 25,000 visitors over the course of three days in early November.